Erwin Schrödinger (1887-1961), Austrian physicist and Nobel laureate. Schrödinger formulated the theory of wave mechanics, which describes the behavior of the tiny particles that make up matter in terms of waves. Schrödinger formulated the Schrödinger wave equation to describe the behavior of electrons in atoms. For this achievement, he was awarded the 1933 Nobel Prize in physics with British physicist Paul Dirac. Schrödinger was born in Vienna, Austria. His father was an oilcloth manufacturer who had studied chemistry, and his mother was the daughter of a chemistry professor. 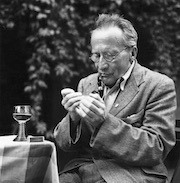 He attended an elementary school in Innsbruck for a few weeks, but Schrödinger received most of his early education from a private tutor. In 1898 he entered the Gymnasium in Vienna, where he studied mathematics, physics, and ancient languages. He then attended the University of Vienna from 1906 to 1910, specializing in physics. Schrödinger obtained his doctoral degree in physics in 1910. After a year in military training, he returned to the university to teach a first-year physics laboratory class. His early research ranged over many topics in experimental and theoretical physics. During World War I (1914-1918) Schrödinger served as an artillery officer and then returned to his previous post at Vienna. Conditions were difficult in Austria after the war, and in 1920 Schrödinger decided to go to Germany. After a series of short-lived posts at the University of Jena, Stuttgart University, and the University of Breslau (now Wrocław, Poland) in 1920 and 1921, he became a professor of physics at the University of Zürich in Switzerland in 1921. Schrödinger's most important work was done at Zürich, and his work received much attention. He succeeded German physicist Max Planck as professor of theoretical physics at the University of Berlin in 1927. Schrödinger remained there until the rise of the National Socialist movement in 1933, when he went to the University of Oxford in England. There he became a fellow of Magdalen College. Homesick, he returned to Austria in 1936 to take up a post at Graz University, but the Nazi takeover of Austria in 1938 placed Schrödinger in danger. Schrödinger was not Jewish, but his opposition to Nazi policies made him a potential target. The prime minister of Ireland, Eamon de Valera, helped Schrödinger get out of Austria. De Valera’s help also led to an appointment to a post at the Institute for Advanced Studies in Dublin in 1939. Schrödinger continued work in theoretical physics in Dublin until 1956, when he returned to Austria to a chair at the University of Vienna. He stayed at the University of Vienna until his death. Schrödinger's great discovery of wave mechanics originated with the work of French physicist Louis de Broglie. In 1923 de Broglie used ideas from German American physicist Albert Eintstein's special theory of relativity to show that an electron, or any other particle, has a wave associated with it. De Broglie's work resulted in the equation λ = h/p, where λ is the wavelength of the associated wave, h is a number called Planck's constant, and p is the momentum of the particle. Physicists immediately deduced that if particles (particularly electrons) have waves, then a particular type of partial differential equation known as a wave equation should be able to describe their behavior. These ideas were taken up by both de Broglie and Schrödinger, and in 1926 each published the same wave equation. Unfortunately, while the equation is true, it was of very little help in explaining the behavior of particles. Later the same year Schrödinger used a new approach. He studied the mathematics of partial differential equations and the Hamiltonian function, a powerful idea in mechanics developed by British mathematician Sir William Rowan Hamilton in the mid-1800s. Schrödinger formulated an equation in terms of the energy of the electron and the energy of the electric field in which it was situated. Partial differential equations have many solutions, but solutions to Schrödinger's equation had to meet strict conditions to be useful in describing the electron. Among other things, they had to be finite and possess only one value. These solutions were associated with special values of the electron's energy level, known as proper values or eigenvalues. Schrödinger solved the equation for the hydrogen atom, V = –e2/r, in which V is the energy of the electric field surrounding the electron, e is the electron's charge, and r is its distance from the atom's nucleus. He found that the eigenvalues of the electron's energy corresponded with those of the energy levels given in the older theory of Danish physicist Niels Bohr. Bohr's theory of the atom described electrons orbiting atoms in strict circular orbits at particular distances that corresponded to specific levels of energy. In the hydrogen atom (which consists of one electron and one proton), the wave function Schrödinger derived instead describes where physicists are most likely to find the electron. The electron is most likely to be where Bohr predicted it to be, but it does not follow a strictly circular orbit. The electron is described by the more complicated notion of an orbital - a region in space where the electron has varying degrees of probability of being found. Schrödinger's wave equation can describe atoms other than hydrogen as well as molecules and ions (atoms or molecules with electric charge), but such cases are very difficult to solve. In a few such cases physicists have found approximate solutions, usually with a computer carrying out the numerical work. Schrödinger's mathematical description of electron waves found immediate acceptance. The mathematical description matched what scientists had learned about electrons by observing them and their effects. In 1925, a year before Schrödinger published his results, German-British physicist Max Born and German physicist Werner Heisenberg developed a mathematical system called matrix mechanics. Matrix mechanics also succeeded in describing the structure of the atom, but it was totally theoretical. It gave no picture of the atom that physicists could verify observationally. Schrödinger's vindication of de Broglie's idea of electron waves immediately overturned matrix mechanics, though later physicists showed that wave mechanics is equivalent to matrix mechanics. During his later years Schrödinger became increasingly worried by the uncertain nature of quantum mechanics, of which wave mechanics is a part. Schrödinger believed he had produced a defining description of the atom in the same way that the three laws of English physicist Isaac Newton defined classical mechanics and the way that the equations of British physicist James Clerk Maxwell described electrodynamics. Instead, each new discovery about the structure of the atom only made atomic structure more complicated. Much of Schrödinger’s later work was concerned with philosophy, particularly as applied to physics and the atom.